We’re always looking for new ways to continue to enhance and improve our visitor’s experience when they come to Eilean Donan, and 2019 will see the latest addition in a long line of new developments. We are delighted to formally announce that we will be launching a brand new Audio Guide service when we reopen for the new season on 1st of February 2019. The state of the art, user-friendly guides will initially offer detailed information on the castle in 8 different languages, specifically; English, French, German, Italian, Spanish, Portuguese, Hindi and Mandarin. Given the incredible range of different nationalities that visit the castle, further languages will be added to this list in future years. The significant financial investment by the Conchra Charitable Trust in the development and provision of the Audio Guides will add greatly to the existing high quality interpretation at the castle. Content includes detail on the surrounding area, historical information and snippets of the intriguing details not always picked up on other tours. Whilst the new service will clearly help visitors to engage more, our wonderful castle guides will still be on hand to answer questions and add that personal touch that we’re so famed for. In addition to theses audio guides, we are also adding to our on-site visitor services with the construction of an extension to the existing visitor centre. The new building will include a new ticket office with automated ticketing machines, a takeaway catering facility, first aid suite and much needed administration offices. Alongside this we have just completed the construction of a new secure locker facility allowing visitors to leave bags and luggage in a safe location while visiting the castle. Visitor numbers to Eilean Donan have more than doubled in the last 10 years and all these new services will help us to better manage the operation, particularly during the busy peak months. Eilean Donan Castle wins a prestigious Scottish Thistle Award. Eilean Donan Castle has won national recognition at the annual Scottish Thistle Awards held on Thursday the 15th of March 2018. 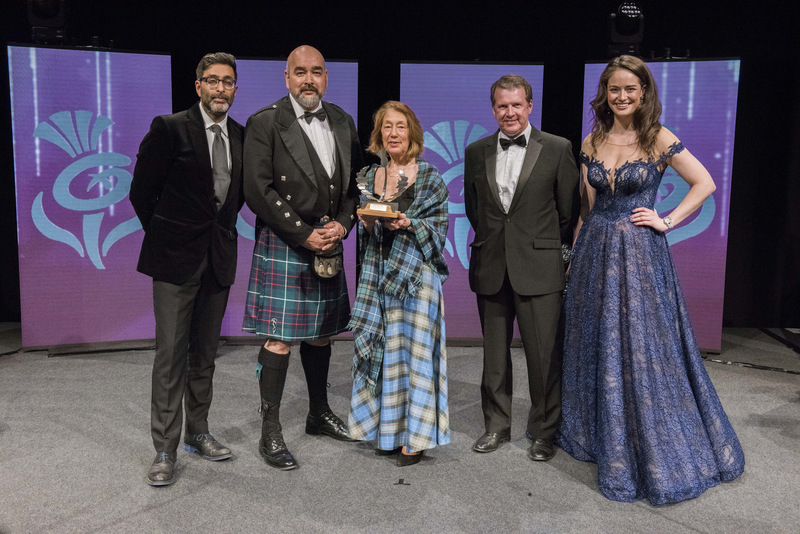 Regarded as the “Oscars” of the industry, Scottish tourism’s premier awards ceremony sponsored by Fishers, took place at the Edinburgh International Conference Centre. 16 individuals, businesses and events were honoured for their innovation, excellence and success in the hospitality and tourism sector. In celebration of the Scottish Thistle Awards’ 25th anniversary, ten past Silver Thistle winners were also in attendance. Still Game and River City star Sanjeev Kohli co-hosted the evening with STV presenter and former Miss Scotland, Jennifer Reoch. Entertainment was provided by ventriloquist and comedian Paul Zerdin, and Hannah Rarity, BBC Radio Scotland Young Traditional Musician of the Year 2018. Organised by VisitScotland in association with the Aberdeen City and Shire Tourism Awards, Highlands and Islands Tourism Awards, HIT Scotland, Scotland Food and Drink, Scottish Licensed Trade Association, Scottish Tourism Alliance, Sportscotland and Wild Scotland. With a record-breaking 750 entrants this year, these prestigious awards are without doubt the ones our industry leaders want to have in their trophy cabinet! Eilean Donan won the national award in the “Best Heritage Tourism Experience” category, sponsored by Historic Environment Scotland. The award caps an incredible few months for the Eilean Donan team which also saw them win their second Highlands & Islands Tourism Award, and attain its 5th Star in the VisitScotland Quality Assurance scheme.